Oddworld: New 'n' Tasty (PlayStation 4) Review – Everybody! Follow Me! When going back to games released in the PlayStation One era of video games it’s hard not to notice the vast creativity and imagination that went into many of the titles. In a current era of gaming that is dominated by annualized franchises that basically offer the same game with different paint each year, it’s crazy to think back to a time where games with true imagination and ingenuity were plentiful rather than scarce. That’s what makes it all the more welcoming to have a game from that era get the remake treatment. Oddworld: Abe’s Oddysey came out for the original PlayStation and PC back in 1997, and today it has been completely remade from the ground up in a new version called Oddworld: New ‘n’ Tasty. 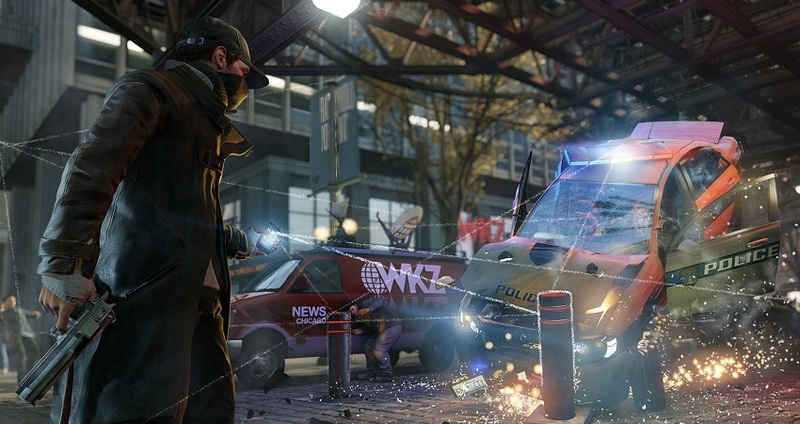 The creators have, thankfully, left the core design of the game untouched, and instead focused on tweaking little gameplay elements and giving the graphics a much-needed overhaul. This unique little side-scroller stars an alien named Abe, who is a pathetic little alien belonging to a race called Mudokans that are enslaved as workers in a factory called Rupture Farms. As Abe wanders the halls of Rupture Farms one night he stumbles across a conversation with the rulers of the factory, and in his eavesdropping he learns very unsettling information. The leaders of Rupture Farms plan to create a new kind of food to sell, and it will be made with the meat of Abe and all of his fellow Mudokans! 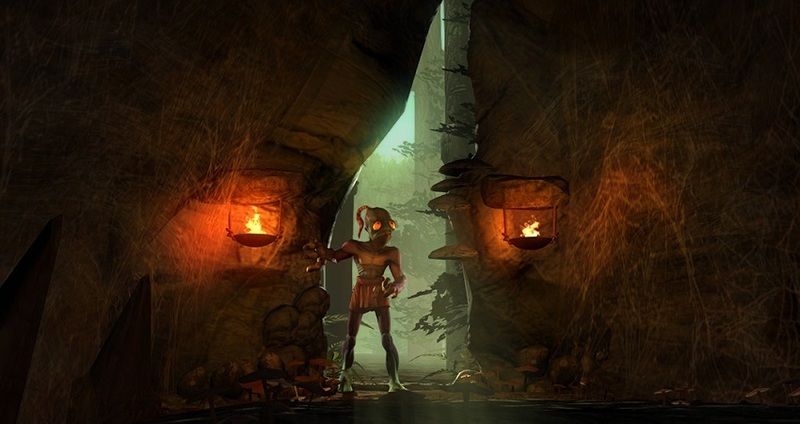 New ‘n’ Tasty‘s main goal is to present Abe’s Oddysey as a game that keeps up, graphically, with the game’s of 2014, and developer Just Add Water performed wonderfully in that regard. This game’s artistic style is gorgeous in its own right, but utilizing the Unity Engine with full HD makes this one of the most visually-pleasing side-scrollers yet. There are plenty of great backdrops in the game, from the ominous factory to the lush forests and night sky in the world beyond Rupture Farms, and each environment is richly detailed. 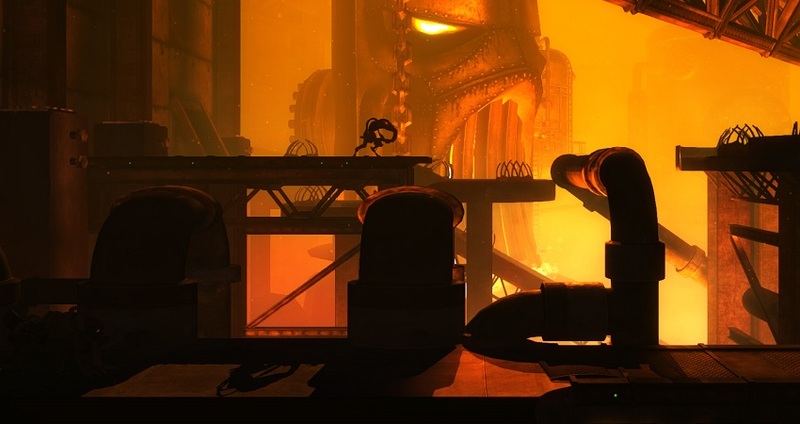 It’s the level design in Oddworld: New ‘n’ Tasty that makes it continually engaging and challenging to play the whole way through. From the very beginning you will have to do your best to tiptoe, jump and roll your way past obstacles and enemies, with many of these operations being time sensitive. Many of these levels are so challenging that they put a lot of modern platformers to shame, showing just how much more difficult games were back in the ’90s. This game will not hold your hand one bit, and that’s part of what makes it so enthralling. Of course, just getting through the levels is only half the battle, as you also have the secondary objective of rescuing as many Mudokans as you can. As you proceed through the levels it is up to you to get the attention of other Mudokans and then command them to follow you if the coast is clear or wait if it isn’t. This is where the true challenge comes in, as ensuring not only your own safety but the safety of the others is always a tricky juggling act. If the enemies ever become aware of your presence they will often take it out on the other poor Mudokans, so you must time your actions very precisely to come out on the other side successfully. Luckily for gamers who aren’t quite as adept at retro platfromers, New ‘n’ Tasty not only offers plenty of checkpoints but also a quicksave feature, meaning that you can save anywhere you want as long as you are on solid ground and not alerting other enemies. This was a vital feature for me in my playthrough, as many times I would have to get through a small section of a level and then quicksave to avoid having to do it all over again. Sometimes the game can have a very trial and error kind of feeling, which is remedied greatly due to the generous saving options that weren’t as present in the original version of the game. The one aspect where the game isn’t so forgiving is the controls. Even though the game controls quite well, a lot of its challenges require pin-point accuracy, and being precise can be very finicky with the analog stick serving as your sole means of movement. The force at which you push the analog stick controls how quickly Abe moves, so when you are in very tight areas trying to avoid bombs and have to move quickly the controls will often do things you didn’t intend. Due to the fact that you will more than likely be doing over sections of a stage several times, it can be very aggravating when you failed because of an unexpected movement. 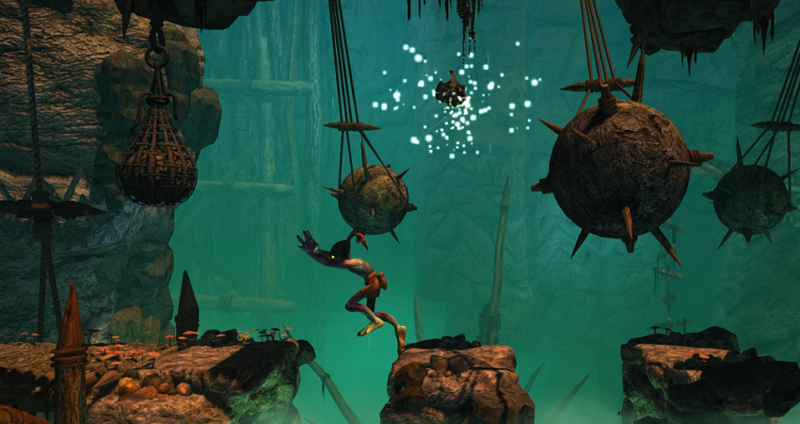 Oddworld: New ‘n’ Tasty is as good of a remake of a classic game that any could have asked for. Just Add Water has breathed new life into this world with beautiful graphics and a respect for the original design that makes it feel the same and new all at once. The game is definitely more difficult than your average platformer, but thanks to the new generous save system and the sense of satisfaction you get from finally overcoming its many trials it never gets to the point where you just want to give up on it. 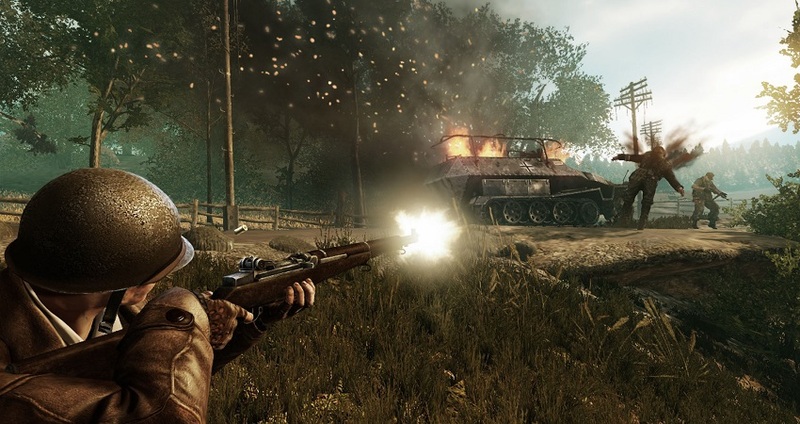 This is a game that was designed in a much different era of video games that now has a modern polish on its surface, and its the balance of both that makes it an unquestionable success. This entry was posted in All, Featured, PlayStation 4, Reviews and tagged Just Add Water, Oddworld: Abe's Oddysey, Oddworld: New 'n' Tasty, PlayStation 4 on July 24, 2014 by Mike Guarino. 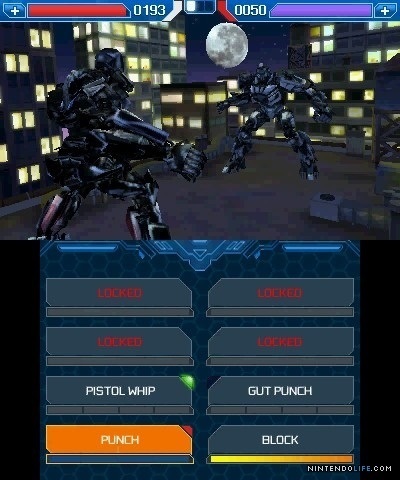 When I was set to receive a 3DS version of Transformers: Rise of the Dark Spark, I was more or less expecting a dumbed-down version of the same game that would be coming out on consoles. The Rise of the Dark Spark that came out on consoles was an action-adventure video game that featured all the standard tropes of the genre and little else, so it would be safe to assume that something with such little ambition would get similar treatment on the 3DS. The 3DS is notably the weakest console on the market, so often times when a multi-platform title is coming out on 3DS it just gets a thrown-together version of a game that is almost certainly superior on any other console. That’s the same case with the 3DS version of Rise of the Dark Spark, right? Wrong! The 3DS version, unlike the console versions that were developed by Edge of Reality, was developed by WayForward Technologies, who are known for developing many titles based on popular licenses. Where the console version is an action-adventure game, the 3DS version is a strategy RPG with turn-based combat that is very similar to the Fire Emblem series. You move around an overworld map and when you land next to a space that an enemy is on a turn-based battle begins. You have three rounds to do damage to each other and pick from a variety of moves that recharge after each turn, with the more powerful abilities taking longer to charge up. Unlike the Fire Emblem games, the story contained within Rise of the Dark Spark is bare-bones. There is a powerful artifact called the Dark Spark that is capable of ripping holes in dimensions, giving its wielder unthinkable power. Of course, the Decepticons (the bad guys) are going after the Dark Spark to take over the world and the Autobots (the good guys) are trying to stop them from getting their big ugly robotic mitts on it. The problem with Rise of the Dark Spark being a strategy RPG is that strategy RPGs rely on an intricate and engaging story to keep the lengthy battles and overall game interesting , but all of we have here is a MacGuffin and everyone is racing towards it with no character development or well-written dialogue in sight. Interestingly, Rise of the Dark Spark switches between the Autobots, Decepticons and mercenaries throughout its 32 missions, giving you different perspectives on the same story. Even though you’re controlling different teams they all control exactly the same and your mission objectives are just as similar. You will be asked to do things like defend a certain area for X amount of rounds, eliminate all enemies on the map and take down walls of defense, but it always comes down to just killing everything in your way. Considering these battles can be lengthy you would expect some more variety in the objectives, but unfortunately the game just cycles through these objectives tirelessly. The types of transformers that you control in battle throughout the course of the game are limited, but they each serve an important purpose. 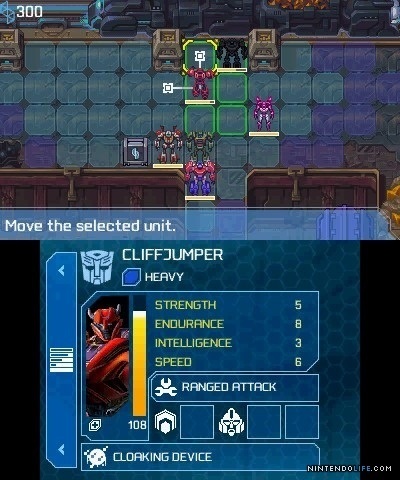 The more powerful “hero” transformers have the highest HP, the strongest move sets and can transform into vehicles to move further than regular transformers. These are your tanks that you send out to the front lines to do the heavy damage and take the heavy damage that will soon be coming your way. Then you have the far weaker hackers and healers who are much better suited to stay in the background and hack objects to attack enemies or heal allies. If you play your cards right, as long as you keep your healers behind your “hero” characters you wont have to worry about losing hardly any units or battles at all. Transformers: Rise of the Dark Spark is surprisingly far more interesting than the games that showed up on all the other consoles, but at the end of the day it’s still a so-so game. As far as strategy RPGs go it’s mediocre at best, as the combat scenarios are repetitive and the story and dialogue are an absolute bore. People who enjoy strategy RPGs and have exhausted all other options will surely find some entertainment with Rise of the Dark Spark, but as you spend more and more time with the game it’s quickly revealed that there simply isn’t enough here to hold your attention for very long. This entry was posted in 3DS, All, Featured, Reviews and tagged 3DS, Transformers: Rise of the Dark Spark on July 20, 2014 by Mike Guarino. Imagine being given the chance to come back to Earth as a ghost after being murdered by a mysterious person, then being given the chance to figure out who it is to bring them to justice and move on to the afterlife. 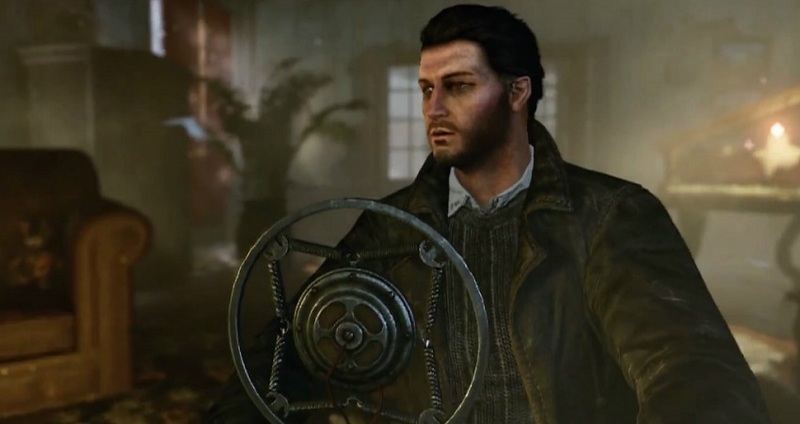 This is the ridiculously cool concept that Murdered: Soul Suspect introduces the gamer to, as you control detective Ronan O’Connor’s ghost following the events of him being thrown out of a window by a serial killer known as the Bell Killer. As would be just about anyone in this situation, Ronan is pretty shocked as to what is going on and why, but a meeting with the spirit of his long-dead wife Julia gives him purpose. She tells Ronan that he can’t join her in the afterlife until he completes the unfinished business that is binding him to the living world, which sends him on a hunt for clues regarding who the Bell Killer really is. What’s to follow is a supernatural noir thriller with no shortage of brooding atmosphere and bizarre occurrences. The setting of Murdered: Soul Suspect is immediately engaging, as we are thrown into a late 60’s era of Salem, Massachusetts. This is where the infamous Salem Witch Trials occurred, which serves as the backbone of the story. As Ronan wanders the streets of Salem in search of his killer, he comes across other ghosts who died and are usually unsure how they died or are completely oblivious to the fact that they are dead. Many of these characters are very interesting and add a lot to the lore of the game and town of Salem, and the game leaves it up to you whether or not you want pass them by or help them move on to the afterlife. The core gameplay component of Soul Suspect plays out in a series of detective puzzles that must be completed to learn new information pertaining to the case. These will require you to search every nook and cranny of a particular area or room, and when you think you have found enough information to come to a worthwhile conclusion you are then able to progress the story. While definitely not the most action oriented gameplay, I really enjoyed snooping around the game’s gloomy environments, as it proved to further immerse me in the game’s world and made me more interested in its inhabitants. However, those looking for a challenging detective puzzle experience will be disappointed, as the game is very straightforward with its puzzles and contains no penalty if you fail to complete its puzzles in the suggested amount of tries. There was one time when I picked just about every wrong clue when the game said it was giving me three tries to find the right clues, but it still kept going and then successfully concluded when I happened upon the correct clues by process of elimination. These scenarios definitely could have used some more time for polish, but even though they aren’t challenging it’s still interesting to see how the following occurrence plays out that the clues relate to. The developers did add a sort of tense action element to the gameplay, but it seems more tacked on rather than fully fleshed-out. You will come across certain areas where poltergeists are present, and you must hide from them in certain locations in order to move on. If you are caught you will hear an ear-piercing scream and then poltergeist will hunt you down until you’re dead. These encounters can create some really tense situations, but I only wish they were a little more challenging. Most of the time it’s pretty easy to sneak past the poltergeists, and if you are spotted getting away from them isn’t much of a challenge. Visually, the game looks solid as the game captures the creepy and ominous tone that the story calls for wonderfully. You’ll come across museums, police stations, cemeteries and abandoned buildings throughout the course of the game, and there’s always a sense of unrest in each area to traverse through. Sometimes it will be a bit of information you come across, a conversation you overhear or ominous imagery that will make you feel continuously uneasy, and that perpetual tension only builds throughout the course of the game. Unfortunately, the game could have used a lot more polish. There will be graphical glitches, command prompts that fail to come up when you want them to and other matter of nagging issues that do hamper the overall experience. 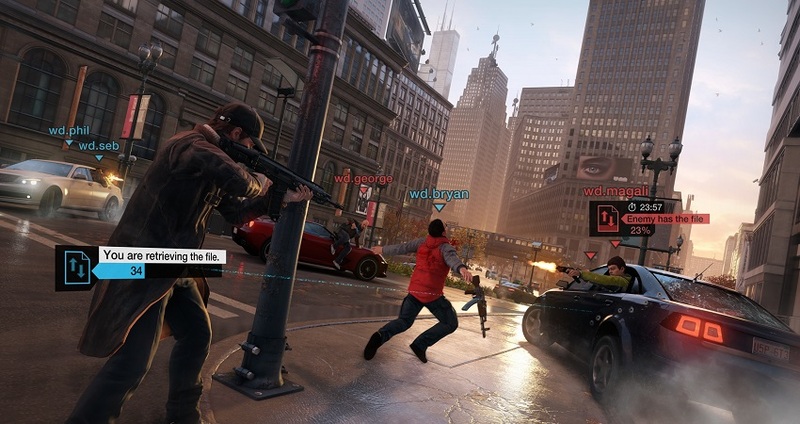 In a game whose main source of immersion is its setting, visual glitches are that much more noticeable and annoying. Considering developer Airtight Games just closed down after the game was released, it seems like they simply didn’t have the resources to completely finish what they started and that’s a shame. 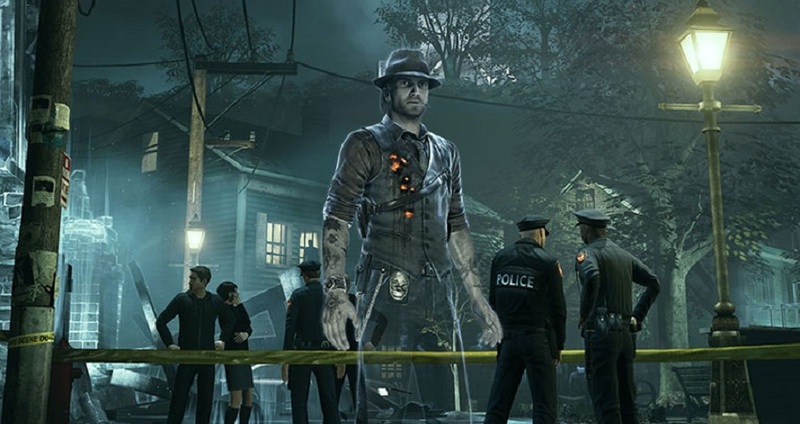 Murdered: Soul Suspect comes up short in a few important areas, but the solid concept and well-realized setting and characters make up for it. Walking through the streets of Salem, Massachusetts in search of your killer is always endearing, and the characters (living and dead) that you come across along the way usually add a lot to the experience. It would have been nice if the game received a bit more polish both technically and mechanically, but even despite its shortcomings it’s able to deliver a solid ghost thriller experience. 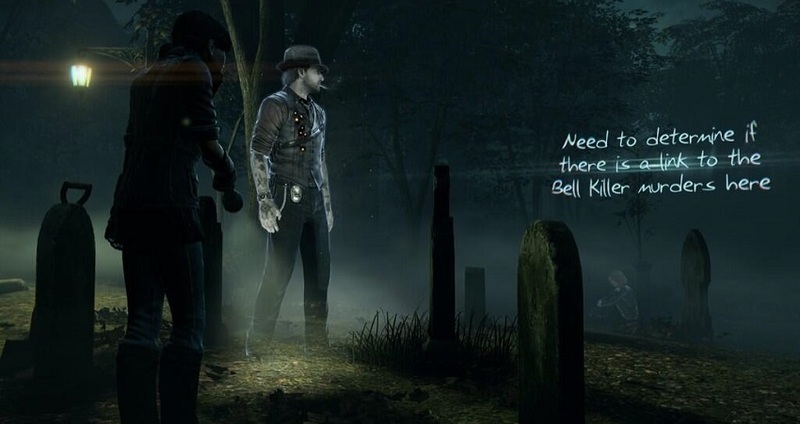 It may not be a complete success, but Murdered: Soul Suspect is nevertheless an engrossing tale of a murdered man searching for justice and closure. 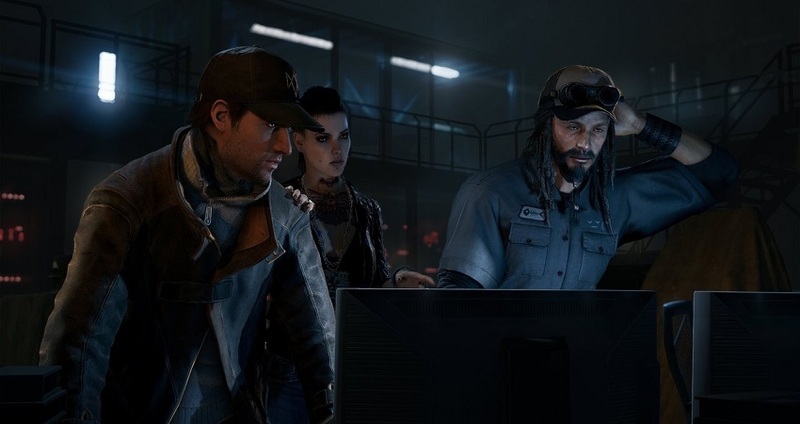 This entry was posted in All, Featured, PlayStation 3, Reviews and tagged AirTight Games, Murdered: Soul Suspect on July 15, 2014 by Mike Guarino. What if I told you that Nintendo had created another game that was ridiculously addicting like Animal Crossing, but in completely different ways? When I first popped in Tomodachi Life, at first I was pretty unimpressed with what it had to offer. Instead of having a world that I could create and fully interact with like in Animal Crossing, i’m more or less a God-like spectator who watches over all of the town’s citizens. However, what at first seemed boring quickly transformed into a world with a bizarre sense of humor and zany scenarios that I couldn’t get enough of. When Tomodachi Life begins you are asked to create a Mii that is your look-alike. 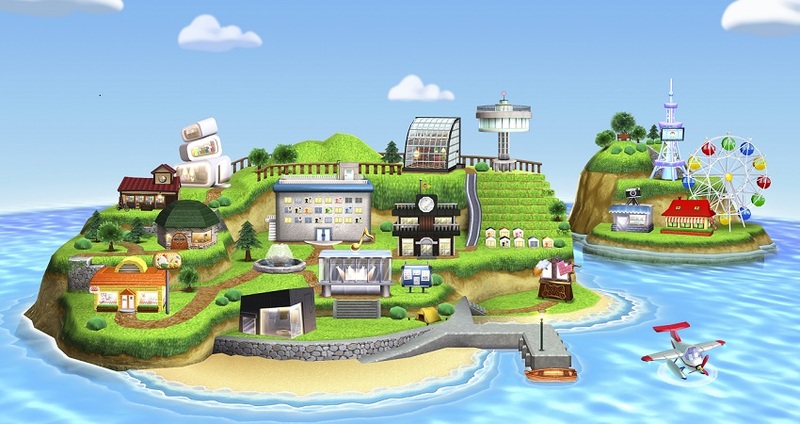 This Mii will be the first resident of the town and thus will begin the life on this little island. What’s fantastic about the creator mechanics in this game is that you can pick what your Mii sounds like, which is fantastic considering the game has full voice-support for all dialogue. When I heard my Mii say back to me my name, birthday and favorite color I was beaming. I’ve always been a fan of Nintendo’s simple-yet-expressive Mii’s, but actually hearing mine talk was another experience entirely. It isn’t until you start creating other residents of the island when the true fun begins. You have the option to create other Mii’s manually or scan them in through QR codes that you can find online. This is what I ultimately ended up doing, as I was able to find QR codes for Batman, Master Chief, Harry Potter and a bunch of other awesome characters. Soon enough, I had an island overflowing with characters that you would never expect to see in the same game and watching them interact and become friends is awesome. In my particular game, Uncle Rico from Napoleon Dynamite and Woody from Toy Story are best friends, which never fails to make me laugh whenever I see them hanging out together. As life on the island progresses and you add more and more Mii’s you will find that new places will appear for your Mii’s to hangout in. Places like coffee shops and amusement parks all provide unique ways for the Mii’s to interact with one another, potentially providing you with another zany scenario for you to witness. One of my personal favorite places is the Mii News station, where one of the island’s Mii’s will report the latest major happening on the island, which is always something completely insane. One particular news story talked about how Thor bought a Power Disco Ball, and suddenly he had a string of good luck that he credited entirely to the purchase of said Power Disco Ball. He reported that he found a tooth brush in the street, his laryngitis went away in 5 days and his acne cleared up by 10%. Who thinks of this stuff? The true depth of Tomodachi Life comes in the form of you interacting and assisting the island’s Mii’s when they need your help. When you do something good for the Mii, their happiness level will increase and you will get some money. This money is used to purchase all matter of food, clothes, furniture and a bunch of strange items that your Mii’s will be begging for. Sometimes a Mii will be hungry and you will have to go and buy their favorite food, and other times they will be bored and ask you to play with them.When playing with a Mii you are usually given one of several very simple mini-games, such as trivia, card games and reflex-based games. While there is really nothing to these games, they are less about providing actual gameplay then they are providing brief bursts of humor. Sometimes you will come across one of your Mii’s sleeping with a dream bubble above their head, and you can tap on the bubble to see what it is they are dreaming about. The last time I played Master Chief was having a dream about him and a bunch of the islanders dancing around a dish containing a fried spring roll, and all of them were chanting, “All hail the fried spring roll!” I wanted to laugh so hard, but I feared I might wake the Master Chief from his slumber. The only true fault of the game is that it’s one that really has no purpose or goal. Unlike in Animal Crossing where you are constantly improving your home and paying off your debt, Tomodachi Life‘s only true purpose is to check in and see what’s going on. This will be a bummer for some, as if you’re not in tune with the game’s style of humor then you will probably get bored with the game rather quickly. However, taken in small to medium bouts of gameplay I found that the game always held my attention and made me laugh more often then not. 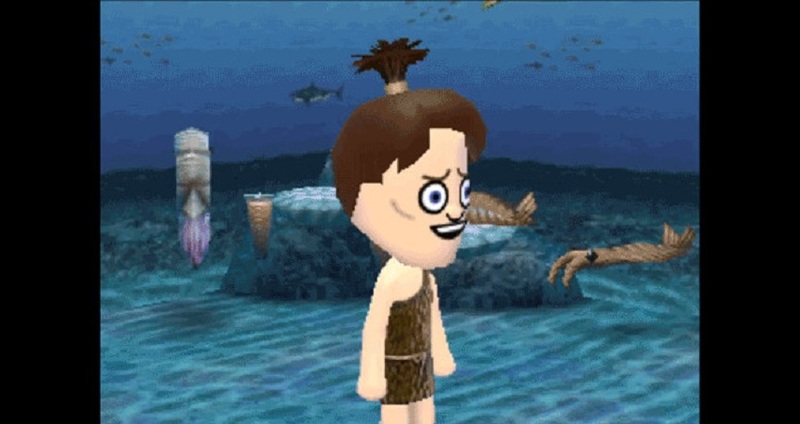 Tomodachi Life is yet another kind life simulator game that is able to stand on its own feet thanks to its charming style and bizarre humor. It’s a game where you feel like you have little to no control of what is going on, and depending on where you’re sitting that could be very good or very bad. In my opinion, though, this game never fails to provide consistent displays of greatly charming and humorous scenarios when ever I pop it in to play. It may not be an Animal Crossing replacement, but it’s a game that I can confidently say is its own unique experience that should be checked out by anyone looking for some light-hearted and goofy life-simulation. This entry was posted in 3DS, All, Featured, Reviews and tagged 3DS, Nintendo, Tomodachi Life on June 30, 2014 by Mike Guarino. 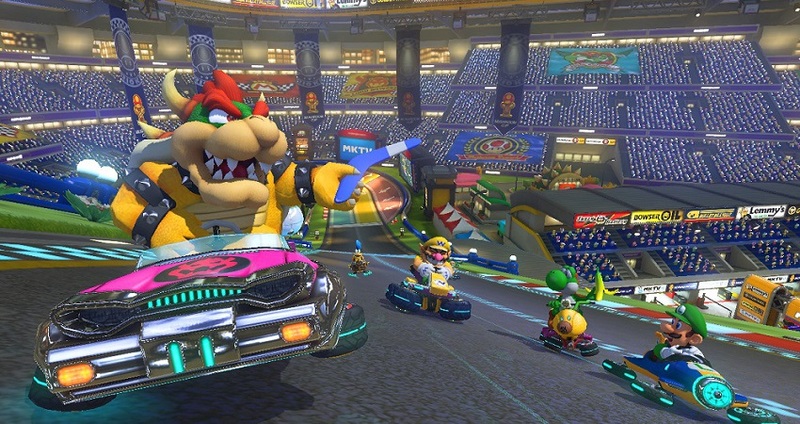 Mario Kart 8 (Wii U) Review – They Did WHAT To Battle Mode?! It’s no secret that the Wii U has been struggling pretty severely ever since it launched a couple years ago, which is largely due to the fact that the system simply had no great games to push the system. Nintendo desperately needed a game like Mario Kart 8 to come along and help get the system off of the shelves and into gamers homes, and now that game is finally here. 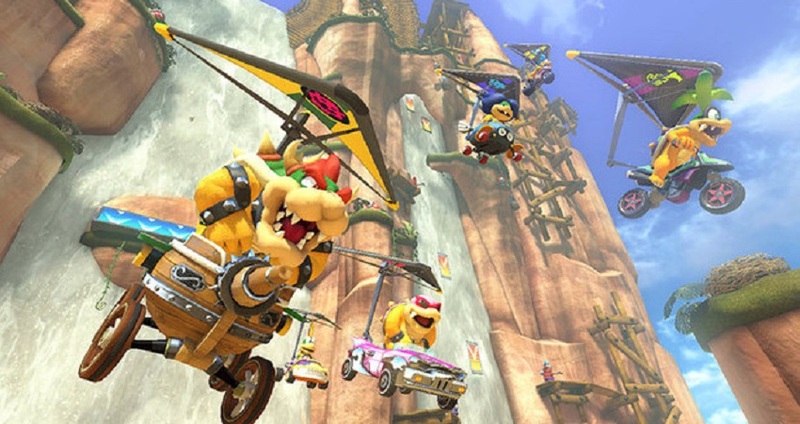 So, is Mario Kart 8 the game that will turn everything around for the Wii U? It will definitely be a game that a lot of people will flock to, but there are a few simple issues that keep this game back from being the home run it could have been. First up, the gameplay is fantastic. The racing has never been tighter or more fun, and all of the gameplay elements that have been gradually added to the series over the years all feel great. However, the big addition to the gameplay is the anti-gravity sections, which have you driving sideways, upside-down and all over the place. These sections are always incredibly fun, because there is always a sense of awe when you see a huge vertical wall coming up and knowing that you will soon be racing across it. As an added twist, when you bump into people while in anti-gravity it gives you a speed boost, giving you more incentive to race a little more aggressively. 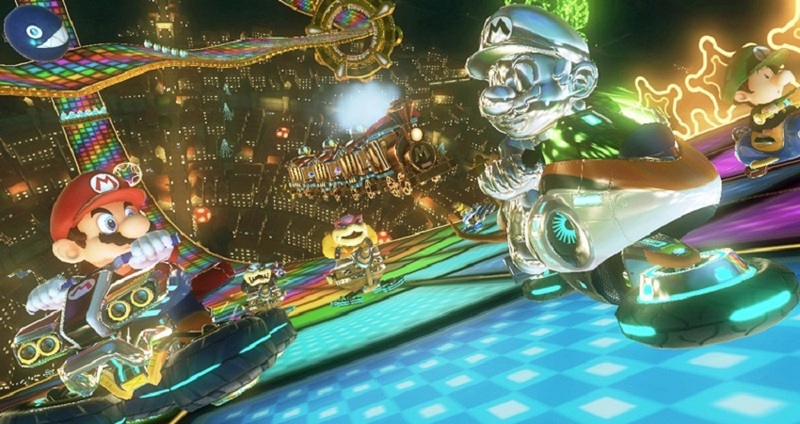 Like with any Mario Kart game the tracks are what determine how much or little fun the game can be, and Mario Kart 8 brings a fresh set of great tracks while also bringing back some classic ones. You have the option to pick from 16 new tracks or 16 classic tracks like in previous installments in the series, but they are all mostly very well designed and look gorgeous. I was particularly impressed with how phenomenal the classic tracks look, as Nintendo really went all out to make them look brand new while also retaining the charm they had on their respective systems. Of course, as you’re zooming down the game’s 32 tracks you will come across a bunch of items that you will be able to use against your enemies, and this time you’ll have four new items to use. These new items are the Boomerang Flower that can be tossed up to 3 times and hit your enemy coming and going, the Piranha Plant that chomps nearby enemies while also giving you speed boosts, the Super Horn that sends out a shockwave that knocks over nearby enemies and destroys all incoming items (even the Blue Shell!) and the Crazy Eight that generates eight items for the player to use. These are all great items, and I especially love the fact that you can finally do something against that damn Blue Shell! Like in recent Mario Kart games you have the option to drive a Kart and a Motorcycle, but the new addition to this game is the option to drive ATVs. ATVs have a similar feel to Karts, with the main difference being that you pack more weight that lets you knock around other drivers more easily. Each vehicle has their strengths and weaknesses, so it all comes down to player preference on what type of vehicle will be best for you. They all control quite easily, as well, which is mostly due to the fact that you can utilize the Wii U’s gamepad, which is a huge step-up from the lackluster Wii remote. You also unlock new vehicles, tires and gliders as you complete more races and collect coins contained on each track, which adds a lot of customization to the game. You can play around with things like overall speed and control, but I mostly ended up just picking the combinations that looked the coolest and still found success. No matter what combination you pick you will have a solid shot at winning the race, so you don’t have to stress out too much on which combinations go best together. There are 30 playable characters in Mario Kart 8, with the game starting you off with 16 of them and having you unlock the other 14 through successful tournament completions. All of the usual cast of characters are here, though the biggest addition this time is the 7 members of the Koopaling Clan. The addition of these characters is a little disappointing, honestly, as they are all basically the same and aren’t characters that are all that memorable. I would have much rather Nintendo gone into the archives and dug out some classic characters that we don’t see as much, but what can you do. My favorite unlockable character is Metal Mario, simply because… well… he’s Metal Mario! Mario in metal form! Another cool little addition to Mario Kart 8 is MKTV, which allows the player to go back to the previous race and view it in a variety of different ways and upload the footage directly to YouTube. This is kind of cool, as watching some of the biggest moments of the previous race in a montage of sorts is always funny, but I do wish that they had let you go a little deeper with the actual editing. It would have been sweet if you had the option to edit together several clips of footage to show off a string of specific moments in a row (say, a montage of just Piranha Plant chomping? ), but this new feature is still fun to play around with, regardless. Other game modes outside of the Grand Prix in Mario Kart 8 are Time Trial, VS Race, Battle and Online. Unfortunately, this is where Mario Kart 8 really drops the ball, as there is a shocking lack of depth and polish to them. Time Trial and VS are pretty standard modes that have been in the series for a while and are decent diversions, but the biggest bust is the game’s Battle Mode. In previous installments in the series you battled against other players in unique arena-style courses that were separate from the game’s main race tracks. In this game, however, Nintendo took the lazy route and just throw you into a handful of regular race tracks found in the main game. Not only is this incredibly lazy on Nintendo’s part, but it makes the Battle Mode very dull and frustrating. The point is to be able to drive around and attack other people, but when you are on a narrow and linear track that is much bigger it becomes much more of a hassle to keep a fluid battle going. Fortunately, the online mode of Mario Kart 8 is very solid, as the connection remains solid and playing with others around the world is as fun as ever. The Mario Kart experience is meant to be played with others, so obviously the online portion of the game is the one that will get the most use, and rightly so. You have the option to do regular races or start a tournament, which is a cool way to compete in something a little more intense than a one-off race. You can do battle mode online, as well, but who the hell wants to do that? Mario Kart 8 is another very solid entry in the series, bringing back all of the great features the series is known for while also throwing in a few twists to spice up the formula. The HD graphics are absolutely beautiful and the new anti-gravity mechanics are a lot of fun on any course. If Nintendo had just delivered the Battle Mode that everyone loves and brought more depth to other modes then this would have easily been the Mario Kart game to beat. Still, this is another game in the series that will, regardless of shortcomings, provide many hours of entertainment for anyone who owns a Wii U. This entry was posted in All, Featured, Reviews, Wii U and tagged Mario Kart 8, Nintendo, Wii U on June 23, 2014 by Mike Guarino.